We have a theory which says it ought to be possible for a tablet and eReader to be combined into a single device that does both jobs really, really well, for an attractive price. Arguablythe Kindle Fire is the closest we'vecome to that so far, but the Fire isn’t available in the UK The Amova 7e G2 is available. and it's billed as 'a tablet design ed for reading' which bodes well. 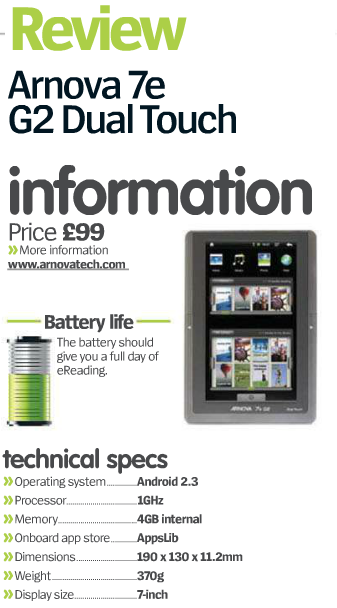 The Amova Te G2 only costs E99, so right away you know it isn't goingto be at the cutting edge. The specifications give more proof of this. There’s 4GB of built-in memory, which isn’t too bad, and an SD card slot on the bottom edge lets you add more. Yes. we said SD card slot. Not rnicroSD. A 1GHz processor sits inside, which helps the Dual Touch move fairly quickly, and Wi-Fi gets you on to the intemet, though there's no SIM support. The build screams budget device being made of rather creaky grey plastic. We do like the two side buttons that double up for page turning when reading eBooks and moving through apps in other situations, but this isn’t the kind of ta blet to wow you with its sharp looks. It is a bit heavytoo at 370g, though it fits very nicely in one hand at 190 it 130 at 11.2mm. The screen, meanwhile, measures seven inches and delivers 800 x 480 pixels. That's low resolution indeed for a tablet these days, and the TFT panel looks every inch a budget quality screen. The re's auto rotate support, but we found the sensor to be very unresponsive and, as a result, auto rotation was hit and miss. Indeed, it didn'twant to work at all for us at times. The touchscreen is resistive which rather surprised us -though using resistive technology is a good way of saving costs. We did n‘t find it a problem to use for simple sweeping or selection, though it does need a fimrer press than more capacitive screens do. But its multitouch support is suspect. We found that the standard finger-pinch for zooming into webpages and the like was unresponsive and zooming it self was jerky. There’s no pinch to zoom support while eBook reading either. There’s no camera or GPS, but if what you want is primarily an eReader with some additional functions, you might not mind this. More irritating, perhaps, is that while the Arnova 7e G2 runs Android 2.3, as is often the case with budget tablets it is not the full version. There are some recognisable Android apps such as email support, Gallery, and the Android music player (the speaker delivers a prettytinny sound by the way). But the Google apps are missing - Google Maps, YouTube, Gmail and, of course, the Market. There’s the AppsLib software market instead, which provides a subset ofthe full Google Market. 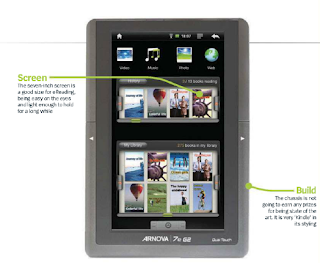 Arnova also adds a Sudoku app, presumably thinking that's the kind of app an eReader owner might like, and there is more than one reading option on board. You get the Aldiko reader, N00K app and Adobe Reader Mobile. The Kindle app, however, wasn’t in the AppsLib store. Several books are provided for you to try out. and on the whole we found the experience reasonable but not wonderful. The screen is certainly readable and not too harsh on the eye. Butthose bezel buttons don't seem to work in the Aldiko reader, which is irritating, and the whole thing feels more like a flung-together product than the fully rounded eReader and Android tablet mix that we really want to see.